Robust, briny, and herbaceous, Italian-style salsa verde usually gets spooned over vegetables and meats at the table, but it works beautifully as a marinade too. Make salsa verde: Whirl garlic and anchovies in a food processor until finely chopped. Add remaining ingredients and pulse until herbs are chopped. Prepare steak and salad: Pour about 1/3 cup salsa verde into a medium bowl. Chill remaining salsa verde, covered. Add steaks to bowl, turn to coat, cover, and chill at least 2 and up to 24 hours; let stand at room temperature during last 30 minutes. Heat a grill to medium (about 350°). Put broccolini on a rimmed pan and brush with about 1/4 cup reserved salsa verde. Brush bread with oil. Grill bread, broccolini, and steak, turning once, until bread is browned and crisp (5 to 8 minutes), broccolini is tender-crisp and tops are lightly charred (about 10 minutes), and steaks are medium-rare (12 to 17 minutes). Transfer to a board as done; tent steaks with foil and let rest 5 minutes. Cut bread into small chunks and cut broccolini into 2 or 3 pieces on a diagonal. Slice steaks diagonally across the grain about 1/2 in. thick, then cut pieces in half. Toss watercress in a large bowl with enough of reserved salsa verde to coat lightly, then transfer to a platter or plates. 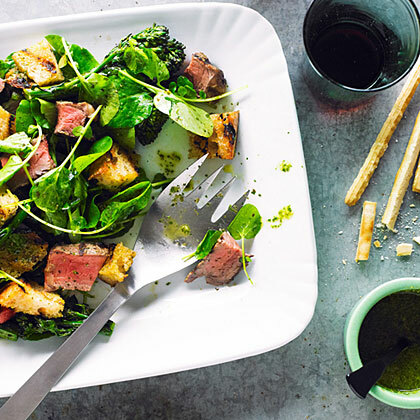 Toss bread, broccolini, and steak with remaining dressing and arrange over watercress.